Reuben Foster missed his 10th game in two seasons because of injuries and suspension and fellow 2017 first-round pick Solomon Thomas remained on the sideline because he’s not good enough to be on the field at crunch time. While the season-ending knee injury to quarterback Jimmy Garoppolo back in September probably ended any realistic chances of the 49ers being contenders this season, the lackluster production from coach Kyle Shanahan and general manager John Lynch’s first draft class has been a major negative this season as the 49ers (2-8) head into the bye week with the second-worst record in the NFL. 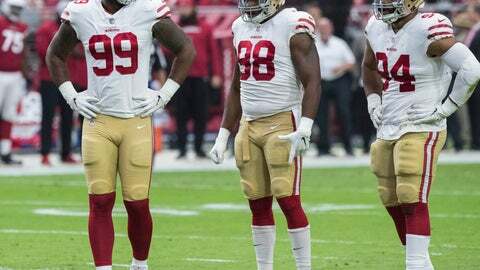 When the Niners return next week for the final six games, those second-year players such as Thomas, Foster and cornerback Ahkello Witherspoon need to show they can be foundation pieces the team expected when they were drafted in the first three rounds. The second-year players haven’t shown that yet. Thomas, the No. 3 overall pick in the 2017 draft, has struggled even to get onto the field in pass-rushing situations. He lacks the speed to come off the edge and hasn’t shown the ability to be one of the team’s top inside rushers so he has been mostly relegated to being only a base defender. Thomas’ only sack of the season came when Oakland’s Derek Carr ran out of bounds instead of throwing the ball away two weeks ago. Thomas has just three other quarterback pressures the past seven games. The Niners traded back into the first round in 2017 to select Foster 31st overall. He showed great promise in 10 games as a rookie, but was suspended the first two games this year following off-field issues in the offseason. He hasn’t been an impact player once he returned as he has been hampered in part by shoulder and hamstring injuries. Foster has no sacks, interceptions, fumble recoveries or forced fumbles in his career and has 10 missed tackles already this year, with his tackle efficiency ranking fourth worst among linebackers with at least 200 snaps. Saleh says he believes the second season can be toughest on a player as outside influences can make them forget what made them successful as rookies. Veteran cornerback Richard Sherman sees that mostly as a crutch that needs to be avoided. The team’s other third-round pick C.J. Beathard, was benched after struggling in place of Garoppolo. Fourth-round running Joe Williams was cut before the season after never suiting up for the team and two of the bright spots from last year, fifth-round receiver Trent Taylor and seventh-round safety Adrian Colbert, have regressed. About the only success so far from that class has been fifth-round tight end George Kittle, who has emerged as a star in his second year, ranking third among all tight ends with 50 catches for 775 yards this season.